Quick Stamps™ are an easy way to award Stamps to users of your program. Unique codes can be generated and printed on stickers, cards or packaging for users to scan and earn Stamps on Stamp Me. How do Quick Stamps work? 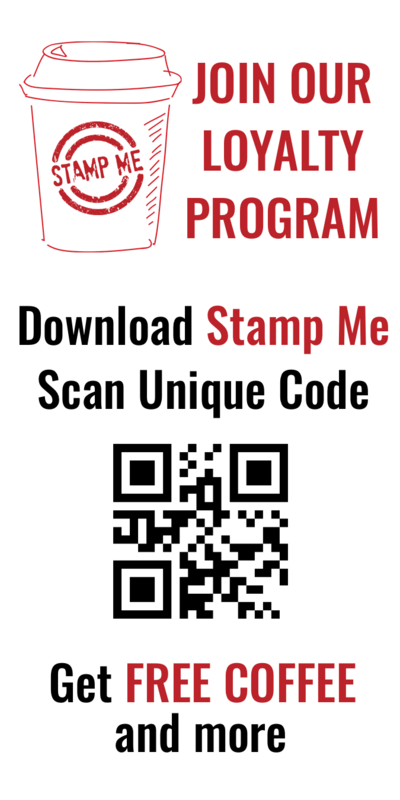 Users simply download Stamp Me on their phone, register and scan the code through Quick Scan to earn Stamps. The first scan of the unique code will also automatically join the user to the Offer and provide the specified number of Stamps. After the initial scan, the code is automatically expired. The user (or any other user for that matter) cannot continue to earn Stamps with that code. How do I set up Quick Stamps? Quick Stamps are a custom product using variable printing and will need to be set up for your business. Please contact help@stampme.com for a quotation. Joe has opened a new coffee bar and is eager to onboard customers to his new loyalty program to help grow his business. He is offering a Free Coffee on joining the program and after every 6th Stamp. 1. Space - the business operates out of a window where bench and wall space is limited to promote the program. 2. Time - the business has peak service periods throughout the day where it is important to minimise transaction time. Allowing the customer to download and collect a stamp in their own time allows him to be efficient during these periods. 3. Staff - the business is reliant on casual staff and they tend not to promote the program. Joe's solution is to place a sticker on each disposable cup during the initial onboarding stage of the program. Customers are presented with a short succinct call to action and can download and register to join the loyalty program in their own time. Raj operates an Indian restaurant in a competitive market. Increasingly the mix of the business has shifted from dine-in to eat-out. As a result, he has become more reliant on delivery services such as UBER Eats, Deliveroo, Foodora, Menulog, Delivery Hero. These delivery services have helped to increase capacity in his kitchen, reduced dine-in service costs (but also sittings at the same time!) and introduced customers that may not have otherwise ever considered his restaurant. However, this comes at a large cost with a fee of 25-to-35% of the total invoice paid to the delivery service business. The profit margins on his food are not that high! Additionally, he is concerned and somewhat saddened that the customer is not getting the complete Indian food experience that they would have received had they dined-in. Once the food has left the shop he has no way if the food arrives hot, on time with good presentation. The food delivery businesses do not share customer information, so he has no way to engage with these customers. Raj's solution is to place a card in the delivery bag with the food inviting the customer to join his loyalty program and a special promotional offer. The customer downloads Stamp Me, registers and scans the card to earn a Quick Stamp. As an additional incentive to get the customer into the restaurant, he offers them a Free Main with any Main purchase to dine-in on a digital voucher that is automatically sent to My Rewards. Jill is the marketing manager for a well-established shoe brand that caters for children, women and men. The shoes are distributed and sold through multiple channels including its own company-owned, franchised and independent stores. The shoes are also sold online. Whilst the brand has traditionally had a loyal following, Jill is concerned that the brands' position is continually being eroded by better value offerings. She has reduced insight into the customer due to increasing fragmentation of the distribution channels and is concerned the brand has lost direct engagement with the end customer. Her fear is that she is losing touch with the market, missing important customer feedback, not properly capitalising on opportunities and is therefore not effectively positioning the brand for growth. This is a large business where small problems can be easily magnified into large problems due to the scale of the business. Jills solution is to create a simple loyalty program where customers are provided with a Stamp for each pair of shoes purchase and a reward in the form of a voucher after 6 shoe purchases. This will provide an incentive to remain loyal to the brand. She understands in her business that it 8 times more expensive to acquire a new customer than retain an existing one so the economics make sense. Additionally, the program is a very powerful marketing tool for her in that it will also provide valuable insight into the customer (who, when, where, how) and permission to directly engage with these customers with targeted and relevant content. Customers are presented with a card in the shoe box with an invitation to join their loyalty program. The customer downloads the loyalty program onto their phone, registers and scans the Quick Stamp code to join the program and earn their first Stamp. As a thank you the brand also offers the customer with an instant digital voucher for joining. It is that easy!